Thanks to the 4th of July, it just doesn’t seem like summer without some red, white and blue. 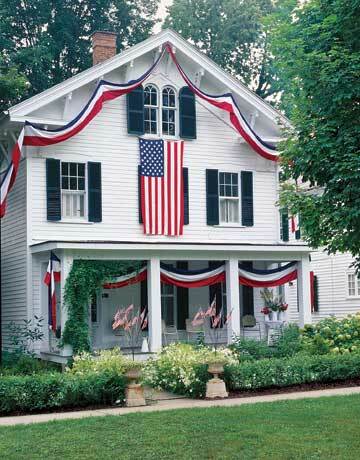 I love this patriotic white house from Country Living, all decked out for the holiday. 28. Cass @ That Old House (Dishes & Dogs) — This One! 62. RehabOrDie.com — Hooked on Brookies! Mmmmm! Best wishes to Grandma Hazel, her family, and everyone this Independence Day. Happy Birthday to Grandma Hazel! I love red white and blue – it means summer is really here! I love it when a family puts forth the effort into decorating a house for the 4th! That is patriotic spirit. Happy birthday to your grandmother! Enjoy the 4th. Great post – I especially love the bandanas in the mason jars. Now this is really getting me in the spirit of the weekend! Have a great one! What a great picture of your family! I love the red white and blue on the porch. It really does get you in the mood. Happy 93rd Grandma Hazel! She looks great! I love the patriotic ideas posted here. I so wish I was creative. After reading your post…I am so in the mood for celebrating July 4th! Bring on the firecrackers…. Linda@ Restyled Home’s last blog post..Oh, I’ll tell you what I want, what I really, really want!! Happy Birthday, Grandma Hazel! You’re lovely! Did you happen to catch “Samantha Who?” tonight? Sam’s mom was trying to sell Dena’s house against her wishes. The decor was delicious! I’d love to see some pictures, but couldn’t find any online. Any ideas? I came on over to link up and saw you had the same (almost) post title! Gorgeous pictures all and a very Happy Birthday to your Grandma Hazel-what a lovely lady. Have a wonderful Fourth of July. Have a wonderful Independence Day! I’m loving your inspirational photos – especially the mason jars with handkerchiefs! Happy Birthday to Grandma Hazel! Hope you have a great time this weekend, and that you get a little break! Give your sweet Grandma an extra hug for me! Wishing you and your family a wonderful July 4th weekend. Thank you for hosting this fun Friday event. The Stylish House’s last blog post..Romancing The Slipcover! What cute ideas! I love cute 4th of July decorations…maybe next year when the outside of our house is done I’ll focus on decorations!! Thanks for the blog party – I love these!! Lindsay @ Likely Design’s last blog post..Happy Homeowner Anniversary to Us!! I’m not in the States, but happy Independence Day for all those of you who are. GReat family picture too! The RWB mason jars… so cute! I’ve got to remember that one (and need to collect some mason jars)! Oh Happy Birthday to Grandma Hazel! 93 is a mighty fine achievement — she looks wonderful. Love the idea of the Mason jars with bandanas and flatware; very clever. And I apologize for messing up putting up my post — I hit the wrong thingie first time, and got an old post up… so I’m on twice. If you can take off the first one, #29 … please do! Cass @ That Old House’s last blog post..Hooked on Beachy Tables, And a Foodie Friday for our Furry Friends! Happy Birthday Grandma Hazel! I especially love Kimba’s idea of the drink glass and everything together to just grab off the buffet. Suzy’s last blog post..Fireworks, Boston Pops, and Special Guest…..
I’ve always loved that Country Living house with the bunting! I posted it at Memorial Day. I visit “Between Naps on the Porch” often and love her table ideas. I only wish I had space in my kitchen for a table big enough to decorate. I really like the mason jars with the bandannas and silverware because it is simple enough that I could do it. Have a Happy 4th of July! Those sunflowers are just lovely! Happy 4th of July, I hope you have a fantastic weekend with all you family, especially your Grandmother. It is my Father’s Birthday on the 4th of July and he’s turning 80. I’m glad to be joining your fun party again after being away and working for a couple of months. I have been photographing Thistle Flowers this week and having lots of fun, come and have a look. I would love to be in the USA over this weekend, it looks like you all have such fun with decorating your homes. Congratulations, Grandma Hazel, that’s wonderful. Those table settings are very clever, and the top house is just gorgeous. Struggler’s last blog post..Giveaway Day! Wishing you a wonderful 4th July weekend from Ireland. What a lovely photo! Happy birthday to Grandma Hazel and well done to you for raising a fine young man. Happy 4th July weekend! Grandma Hazel…I’m happy you were born! 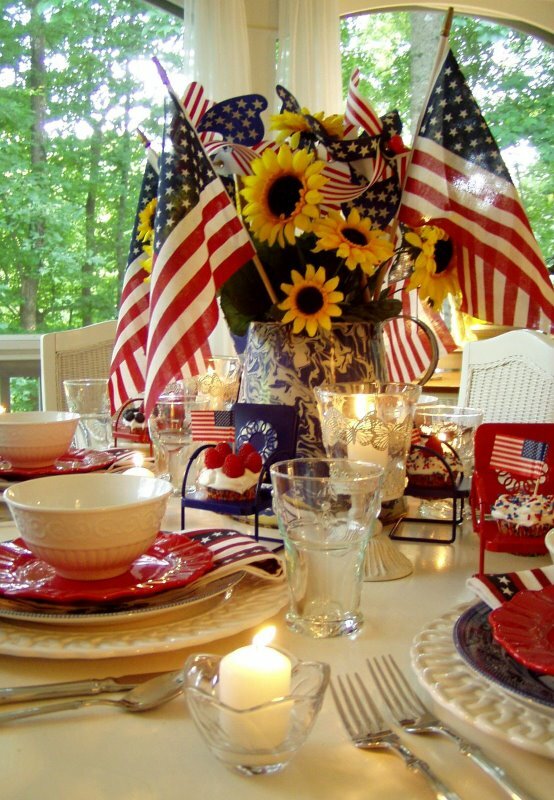 Love the red,white and blue photos…Susan’s tablescape was just beyond wonderful wasn’t it? ps…what a cutie your son is!!! Robin All Things Heart and Home’s last blog post..Big Bodacious Blondies! WoW! Grandma still looks gorgeous, isn’t she? Who thinks she’s 93? Wonderful age and I wish I reach the age when my time comes. Have a fab 4th of July celebration, Julia. I can see that you’re ready to celebrate both BDAY & 4th of July celebration. Your son is handsome young man, reckoned my 17th yr old daughter. I love all your red, white and blue stuff. 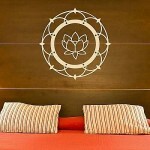 I am a huge fan of your hooked on houses blog! A warm Happy Birthday to your Grandma Hazel!!! What a great entry, of 4th of July showing of Red, White and Blue! That Country Living picture is one of my all-time favorites – not only for the 4th decorations, but for the house itself!! Cute ideas, as always – have a great 4th of July!! What a beautiful photo of the three of you! I am joining for the first time. I am soooo hooked on Longwood Gardens and taking pictures there. Happy birthday to Grandma Hazel – she looks fabulous! A BIG HAPPY 93 to Grandma!! Love the images in your post, Julia! Happy July 4th! Let the games begin! Great pics, Julia! And Happy Birthday to your Grandma. have a great 4th of July weekend. Have a sensational long weekend, and a great birthday celebration with your grandma Hazel, Julia. Wonderful post! I love that photo of the white house with the great front porch decked for the 4th of July! It has alot in common with the front of our house and gives me hope that one day our might look just as lovely. Jamie’s last blog post..So busy sewing! Oh Julia, how precious! I wish your Grandma Hazel a very Happy Birthday. I just love that you are with her! Have a lovely weekend! Enjoyed your post as always! Debbie’s last blog post..Make your own Strawberries! Mason Jars: Brilliant!! I love that banner on the top photo – how it flows from end to end….wonder if it was custom done?! SO beautiful! Thanks for this great patriotic post! Angela’s last blog post..I’ve been tagged!! Wow! Beautiful pictures Julia! Happy Birthday to your grandmother as well. My post today is a tribute to my grandmother, who we are laying to rest in a few short hours. I can feel her dancing in Heaven already! This has absolutely nothing to do with today’s post rather it’s about a movie house. I just saw The Proposal (Sandra Bullock/Ryan Reynolds) last night and while the movie is OK, the house where Sam’s parents (Mary Steenburgen?/Craig T. Nelson) live in Alaska is spectacular, imho and the setting is equally beautiful. One to add to growing list. Happiest of Birthdays to Grandma Hazel! Cheers! What a festive weekend to celebrate a birthday on! Love the tablescapes! Happy 4th, Happy weekend, Happy everything! Diane’s last blog post..Hooked on Fridays! Thanks for having another Hooked on Friday’s party! I just love this one cause it reflects my mood for the week end! Most of all ~ enjoy your family! What a gorgeous house! I love that patriotic banner haning from the porch. It looks so pretty hanging against the stark white house. Deana’s last blog post..Hooked on Fireworks! Happy Birthday to Grandma Hazel! I am new to the blogging world, and yours is one of my new faves! Beautiful! Happy 4th to your family! Amy’s last blog post..Christmas Jackpot and wounded pride! Happy Birthday, Hazel and Happy Birthday, America. Really enjoyed the Red, White & Blue post. That was my theme this week, too! Happy 4th of July! Those photos are brilliant and the house looks gorgeous all done up for the holiday. Grandma Hazel, you are one pretty lady! Happy Birthday, and have a great 4th! Amy @ Living Locurto’s last blog post..Happy 4th of July! Grandma Hazel is a gem, my own Grandma Loretta passed away at 92, just before my first son was born, and she was wonderful. I’m sure she’s smiling down from Heaven looking watching all 3 of my boys grow! I love the bandannas in the mason jars! Happy Birthday Grandma Hazel! Hope your July 4th was a nice one. Happy bday Hazel! What a great post! Sorry I missed the Hooked on Friday… I’ll be back later this week. 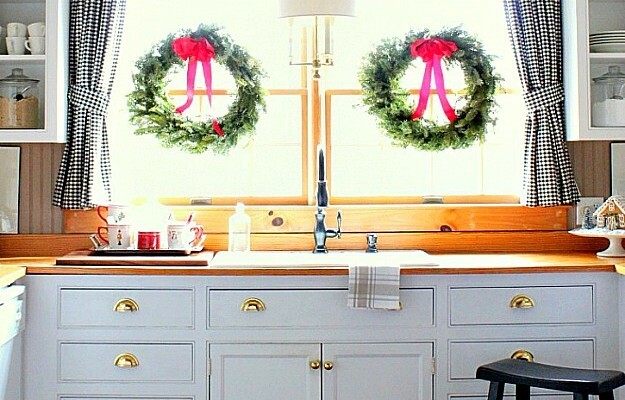 .-= Cristin´s last blog ..East Hampton Dream Kitchen by Phoebe Howard =-. Happy Birthday to Grandma Hazel!! .-= rue´s last blog ..I’m still here… =-. Love the red, white and blue! My mother and I loved the “hotdog” holidays. No presents to buy, you can always serve the hotdog food, no headaches. We loved the red, white and blue on the porch. Thanks for posting those photos.